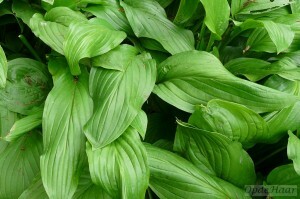 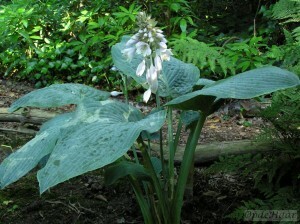 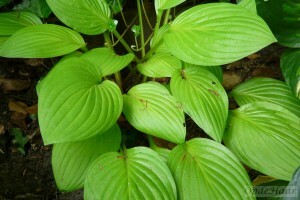 Especially for a shade garden, the hosta is an invaluable plant. 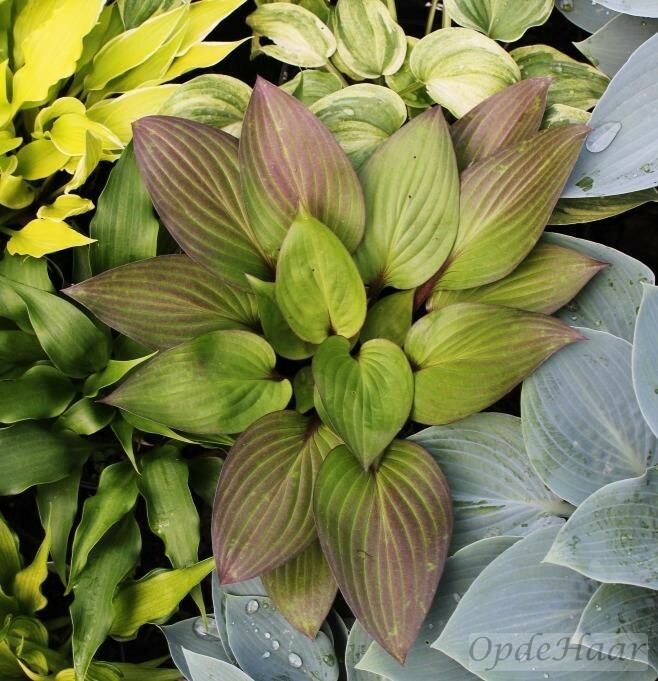 Together with hemerocallis (day-lily) and heuchera, it is a species that is a favourite with American hybridisers and many variants consequently have their origins in The New World. 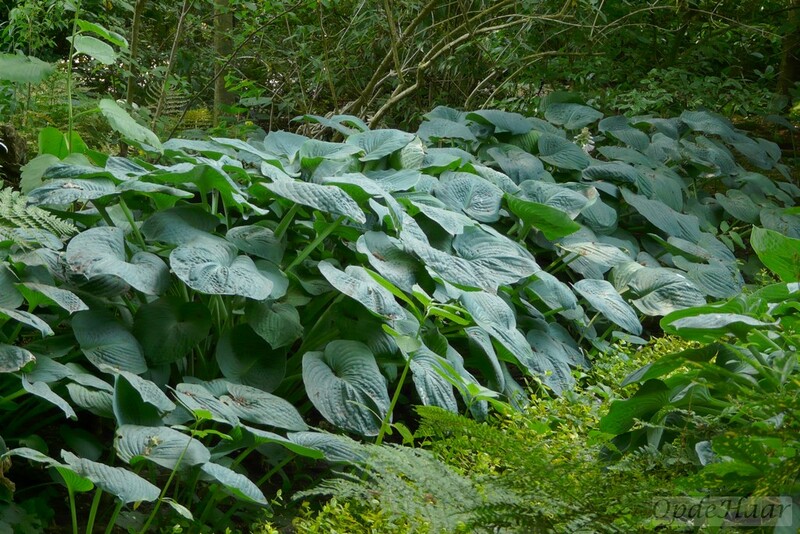 That said, The Netherlands boasts one of the larger specialist nurseries – Fransen in Ter Aa, where all of the varieties of hosta seen in our gardens are to be found. 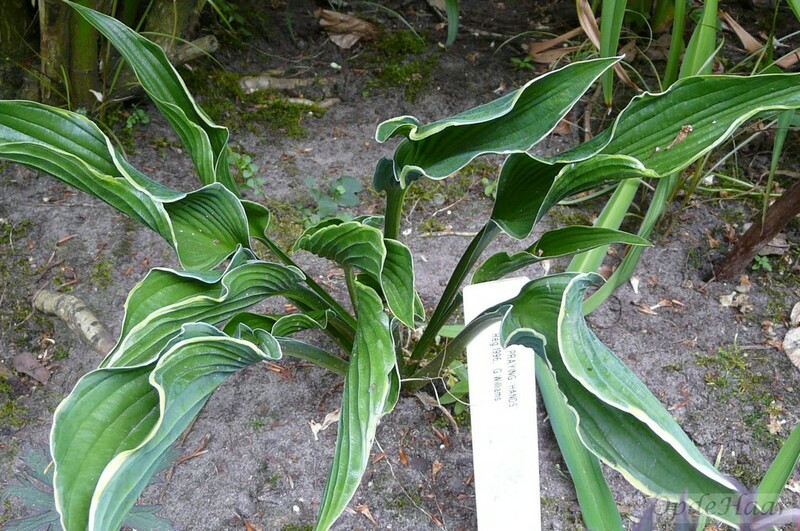 People interested in a more systematic look at the hosta varieties are recommended to visit a national collection notably that in Arboretum Trompenburg www.trompenburg.nl (Rotterdam) where varieties are conveniently planted in alphabetical order. 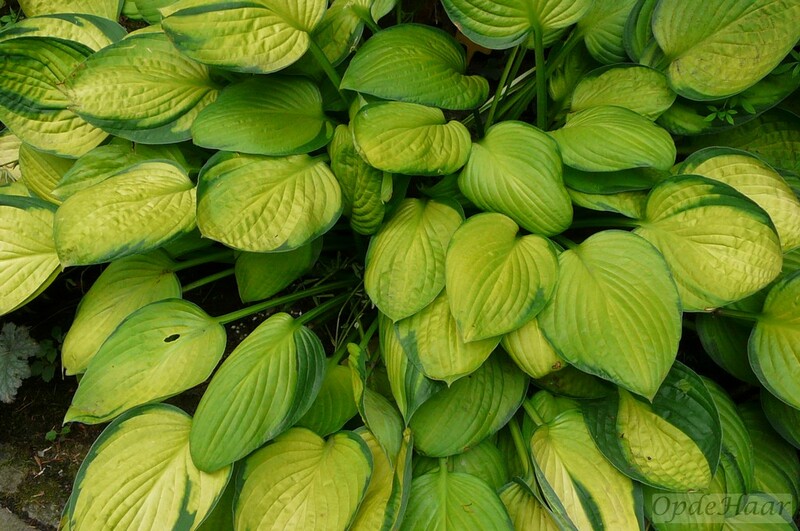 Hosta are very undemanding in their cultivation requirements but if there is one big secret to keeping them happy, it is that they should NEVER be allowed to dry out around the roots. 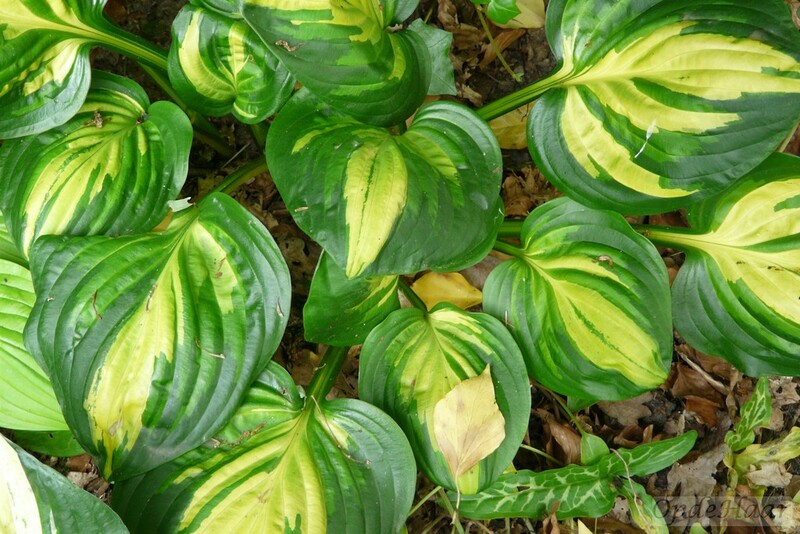 Persistent dryness caused by increasing competition from expanding roots of adjacent trees or shrubs or expanding leaf canopies or any sort of drought is one of the few things that can cause the loss of a plant. 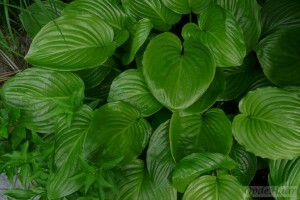 The reason I make something of a point of this is that I have experienced it myself. Hosta are the prototype “tough cookies” when it comes to cultivation requirements but you will notice how they literally shrink during a dry summer and will be noticeably smaller the next year after a drought. 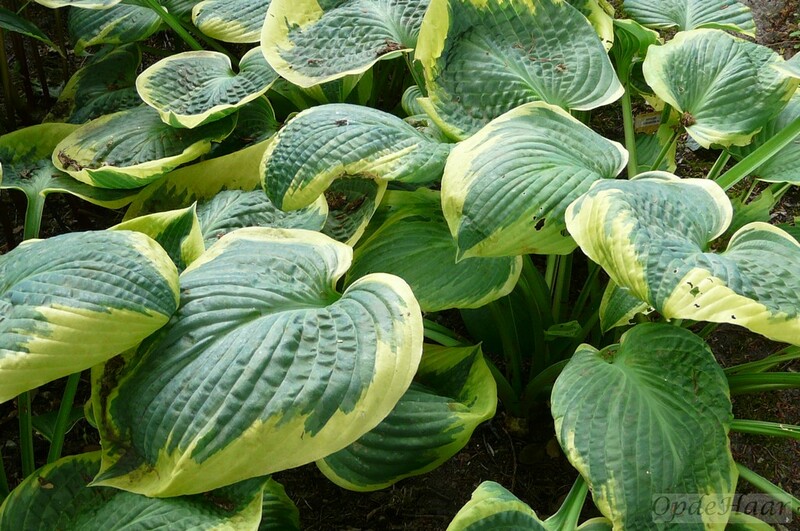 If you decide to set about growing the Hosta giants such as Empress Wu or Sum and Substance, spring-feeding, good mulching and a moist soil are especially vital to ensure show-stopping plants. 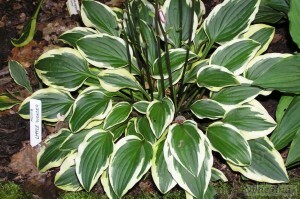 Unless you are prepared to water regularly, don’t subject both yourself and the hosta to the misery of planting in dry soils. 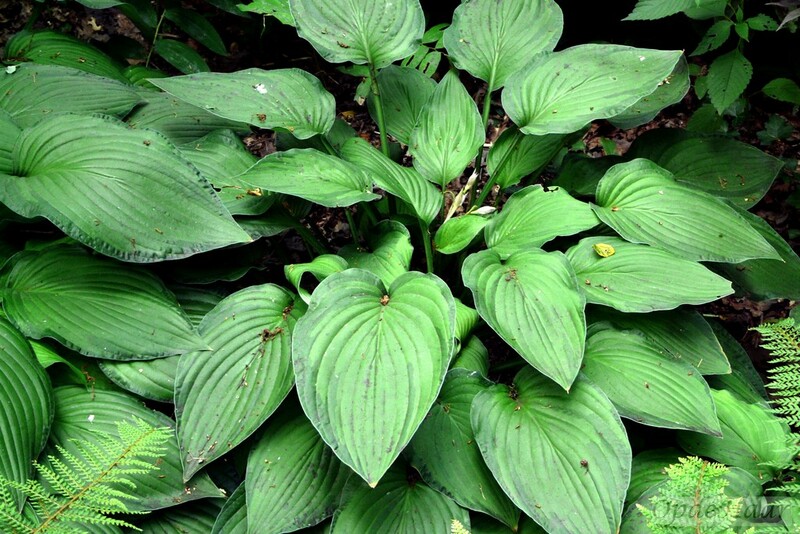 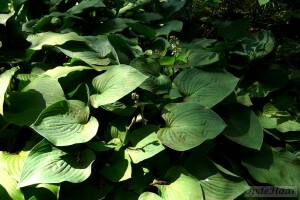 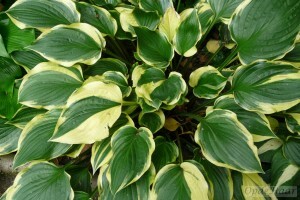 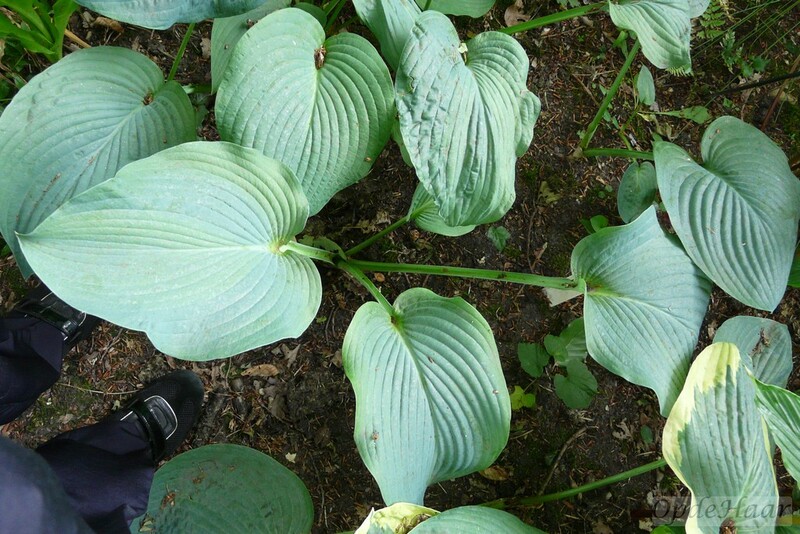 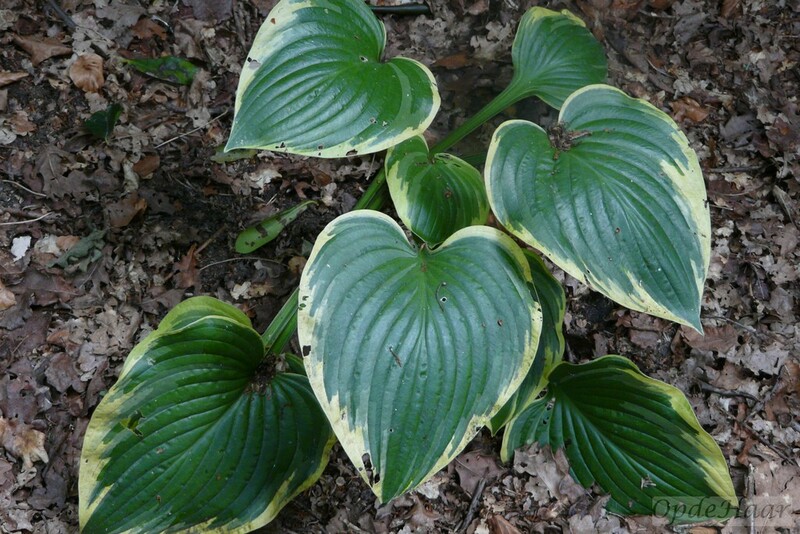 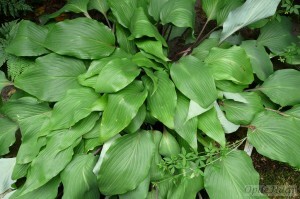 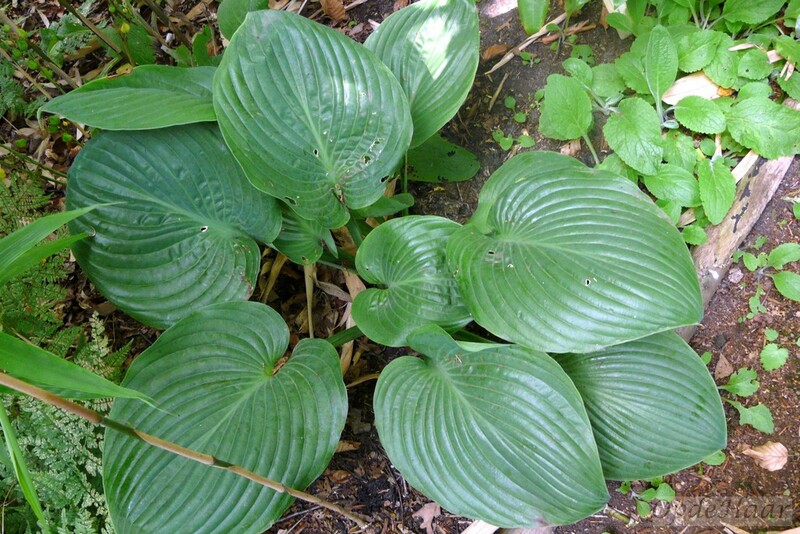 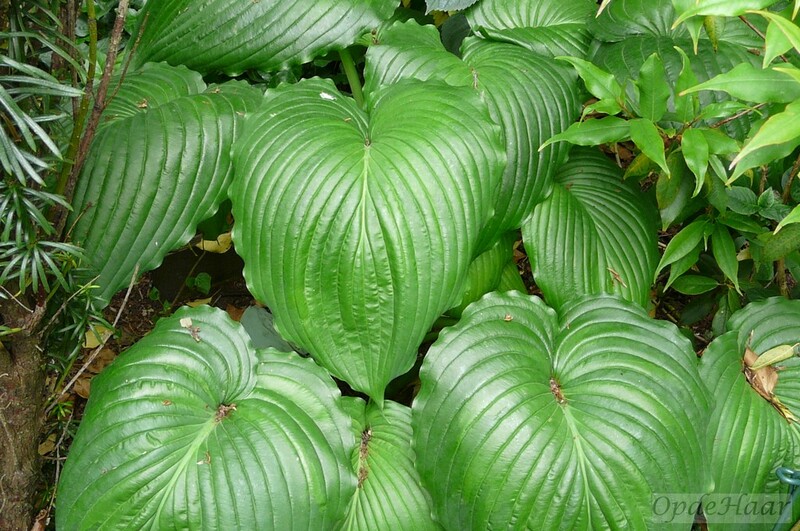 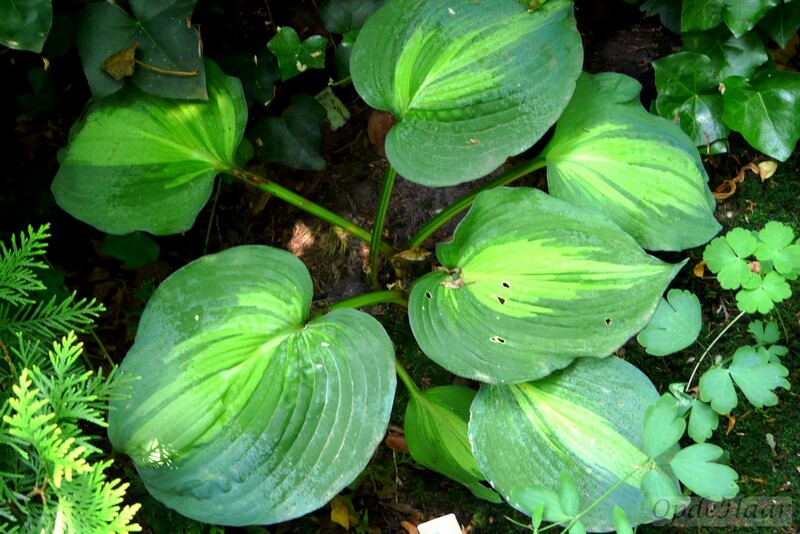 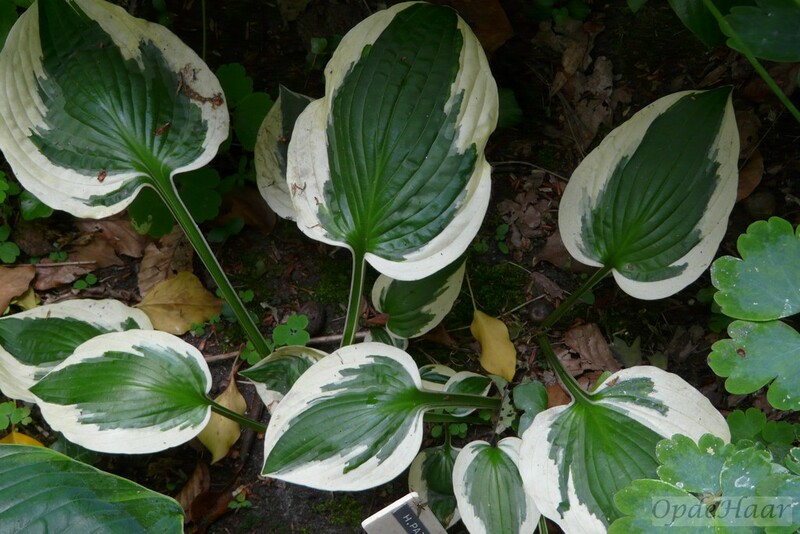 For the non-specialist, we focus on 4 types of hosta characteristics. Another characteristic could be scented flowers but flowers are arguably secondary to other hosta attributes and we have never selected plants for their flowers, although in August they can put on a good display. 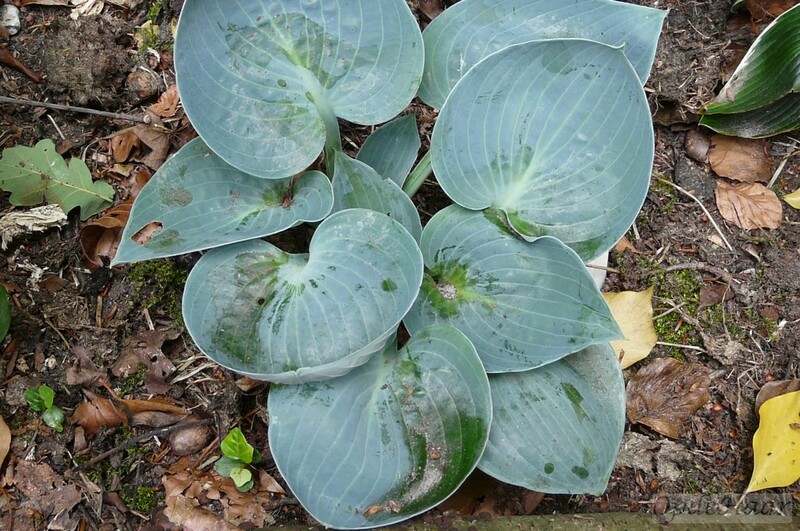 There are some people who deliberately remove flowers from hosta because they regard them as distractions on a foliage plant. 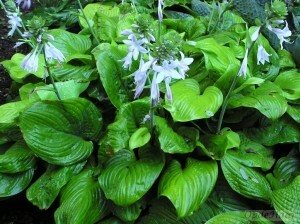 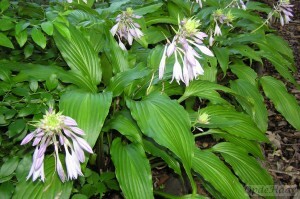 That is a matter of taste but attention has been given to the fact that some hosta flowers are distinctly scented. 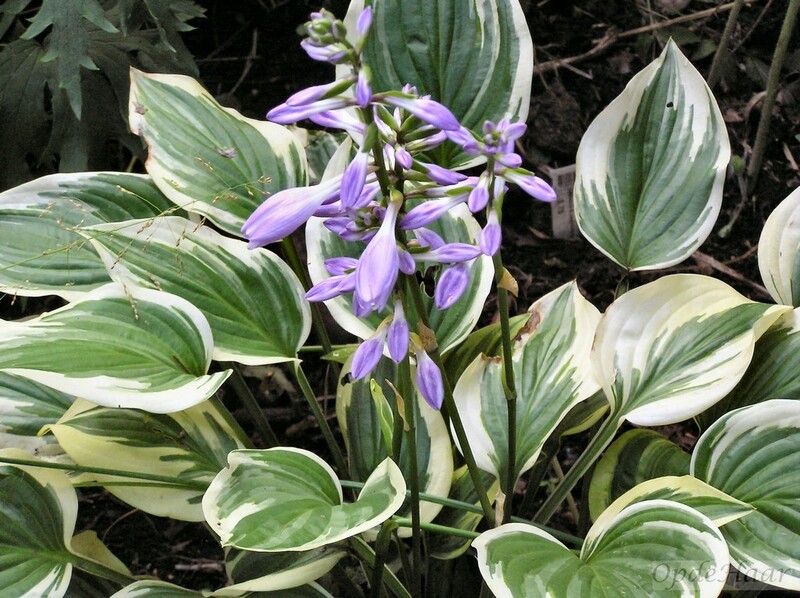 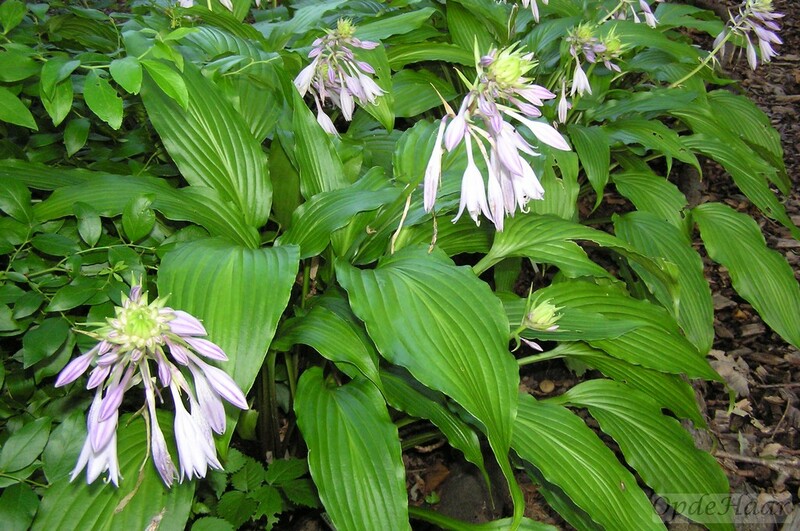 The classic scented species is Hosta plantaginea but for those interested in taking it further, the internet has many references but an excellent general review, entitled “Fragrant Hostas” is that provided by Tony Avent. 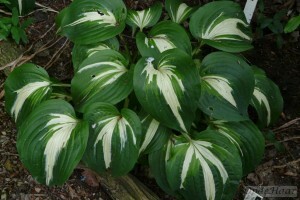 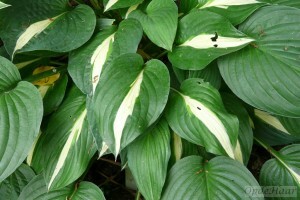 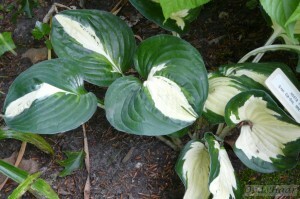 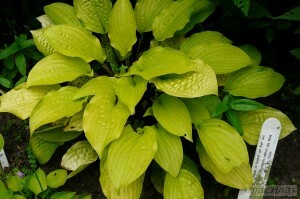 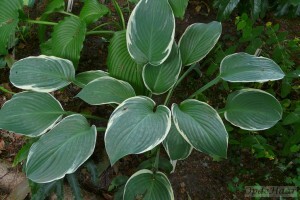 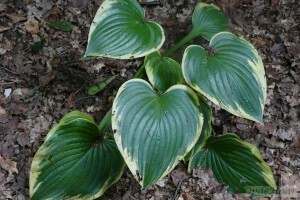 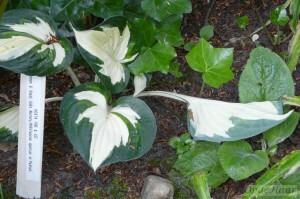 Increasing numbers of hosta with red stems (petioles) have been introduced in recent years and occasionally some of this pigmentation extends a little into the base of the leaf (http://www.hostalists.org/hosta_list_rsh.php). 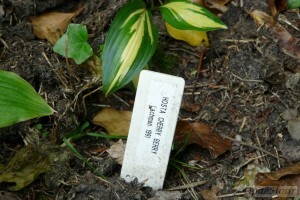 As I write these lines in June 2016, limited supplies of “Red Blush” are on sale here in the Netherlands and Bob’s photo is indeed representative of what I have seen. 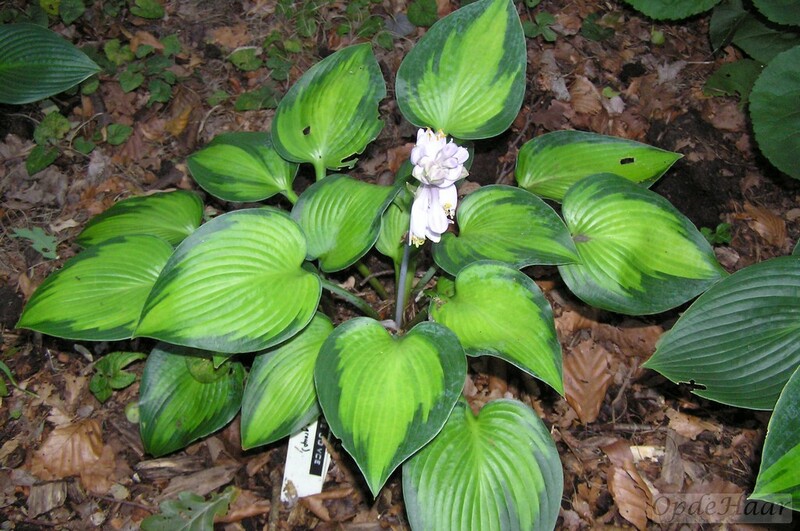 Red/purple colouration in plants arises from anthocyanin derivatives and, in the case of hosta, has attracted attention in the sense of published material more in the context of very dark flower colouration than in leaf pigmentation. 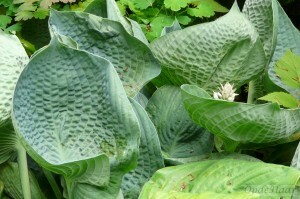 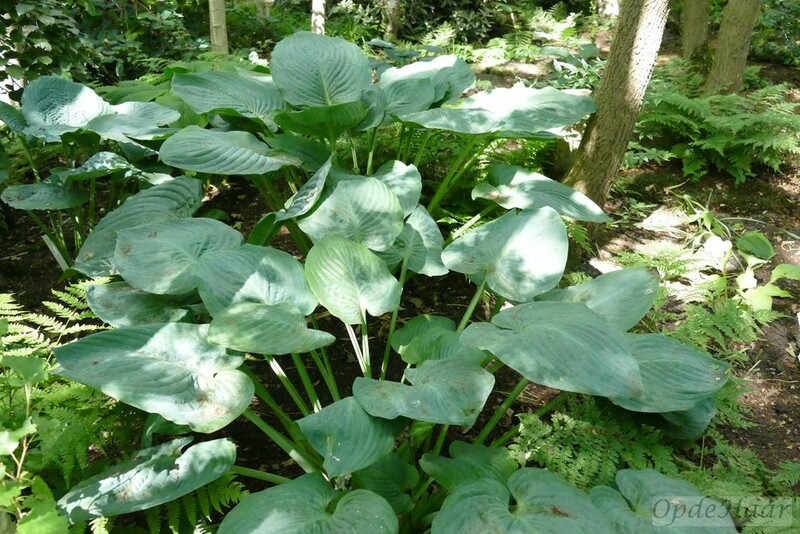 That said, Solberg himself has outlined something of what has driven his efforts – http://gardenseeds.swarthmore.edu/gardenseeds/2008/04/dreaming-of-a-red-hosta/ and https://www.youtube.com/watch?v=t4e0IETk2LM. 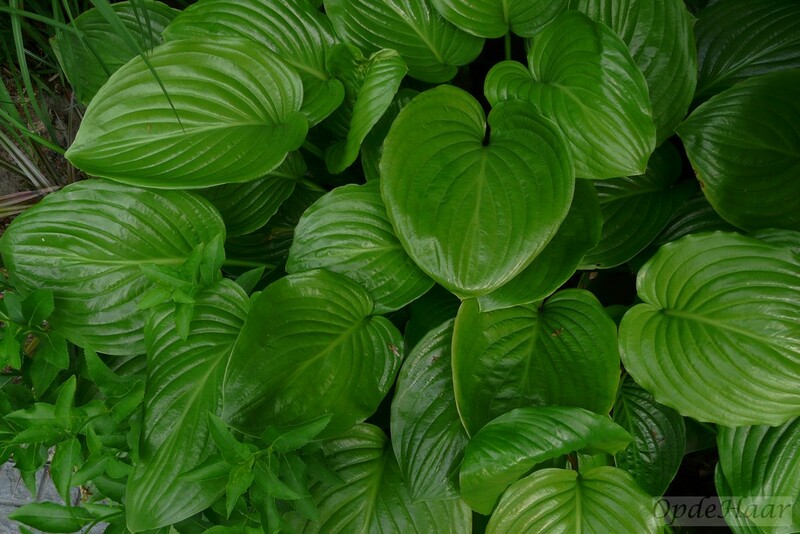 To judge from recurring remarks in the literature, one major barrier which needs to be overcome is to achieve some stability or persistence of the anthocyanin compound(s) in the leaf. 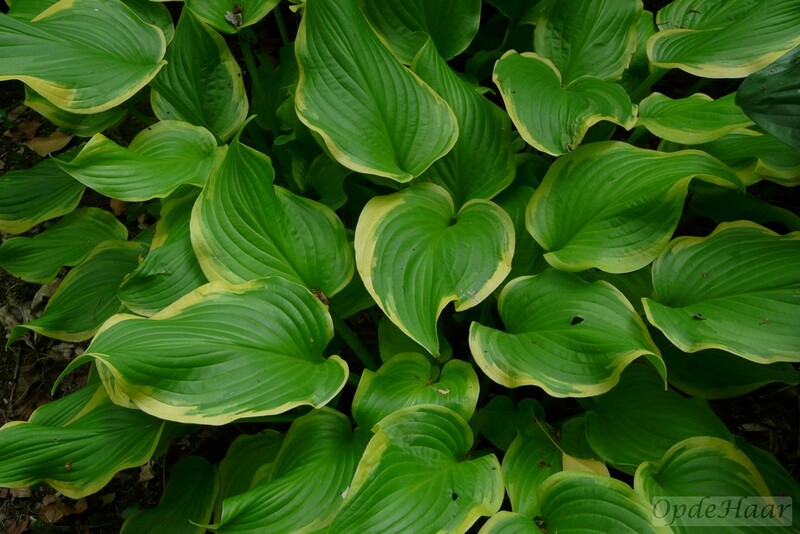 Elevated temperatures seem to indicate thermal instability – Solberg states > 92 deg F or 33 deg C as critical and postulates that performance in cooler climates is therefore a reasonable expectation. In view of the fact that anthocyanin-related colouration is fairly widespread in the plant kingdom and even on hosta petioles, it isn’t unreasonable to expect that improved red/purple pigmentation will eventually be achieved. The possible mechanisms involved are beyond the scope of this website and could even extend to changes in the photosynthesis mechanism as temperatures rise. 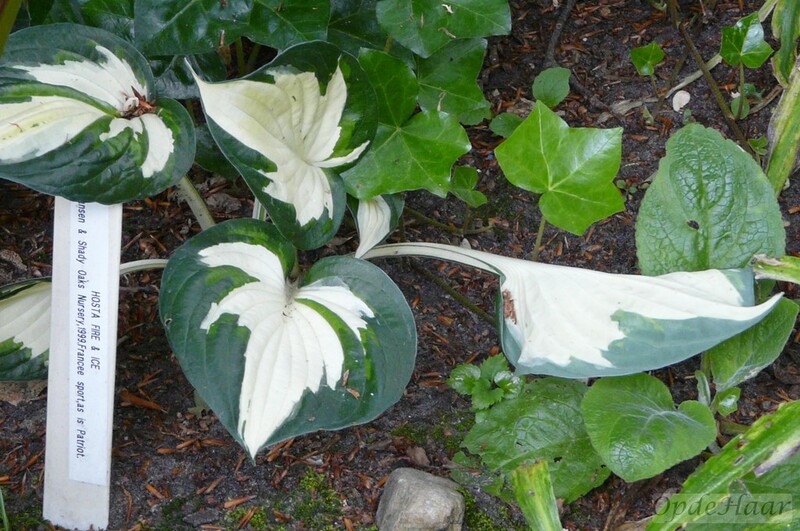 It would be tempting to see to what, if any, extent putting a plant at, say, 22 deg C could restore the red leaf colouration and exploring this pigmentation phenomenon could constitute an enormously interesting and educative research topic for a young botanist! In January 2018, Solberg’s patent for a Hosta plant named “First Blush”was published by the US Patent Office under the number PP 28920. 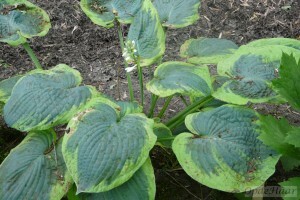 The general curse of hosta is slug damage, which in extreme cases can reduce leaves to chewed off stumps and ugly perforations. Many larger leaved plants seem fairly resistant to visual degradation but we keep a close eye on signs of attack and then sprinkle metaldehyde pellets close to the stems. 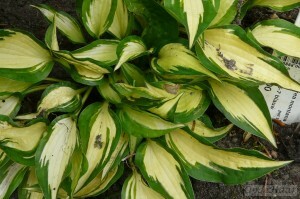 This is often enough to get rid of the smaller, ground dwelling slugs which do most damage. However, we do find that birds and frogs seem to keep most slug damage to a minimum and pellets are not often used until late in the year, if at all, even on our miniature hostas. 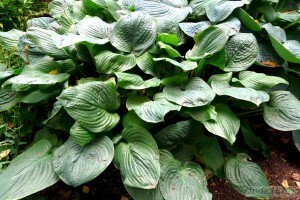 Bulking up” or increasing the number of hosta variants is classically done by splitting up the crowns as plants emerge in the spring. 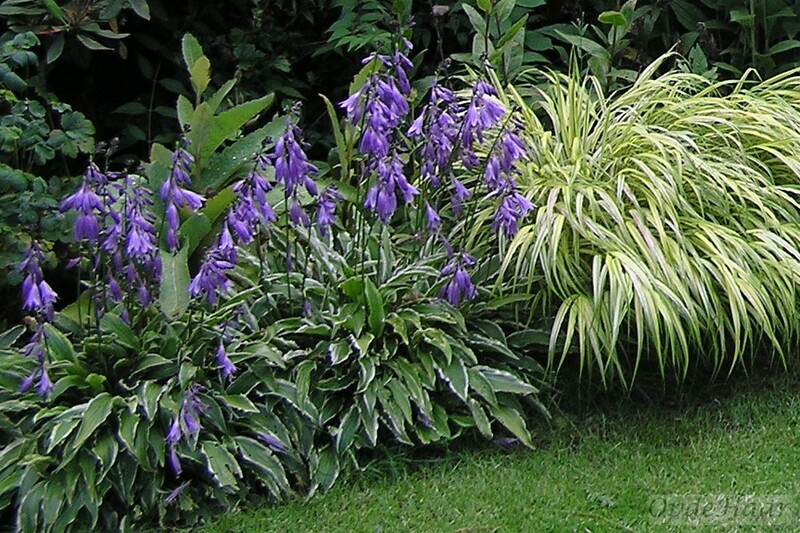 If you select plants at a garden centre or nursery having several crowns or growing points, you can, in our experience, wash the soil off the roots and cut plants into several sections at any time during the growing season. However, a lot of our bulking up comes from potting up seedlings, which are very numerous around many of our plants. 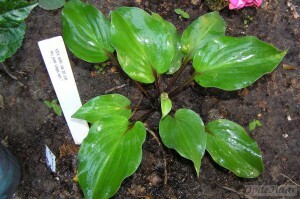 Technically speaking, most if not all seedlings from hybrids are individually new varieties although visually they are often indistinguishable from their parents. 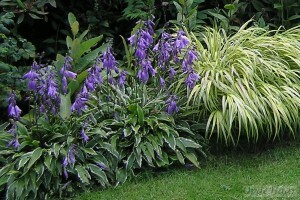 (This is in contrast to aquilegia when several varieties are planted in close proximity.) 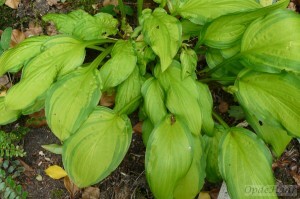 For example in the Millennium Garden, all the hosta down the side of the ditch are seedlings from Hosta sieboldiana “Elegans”,which they resemble with the exception of around 5 which seem to have a more golden leaf. 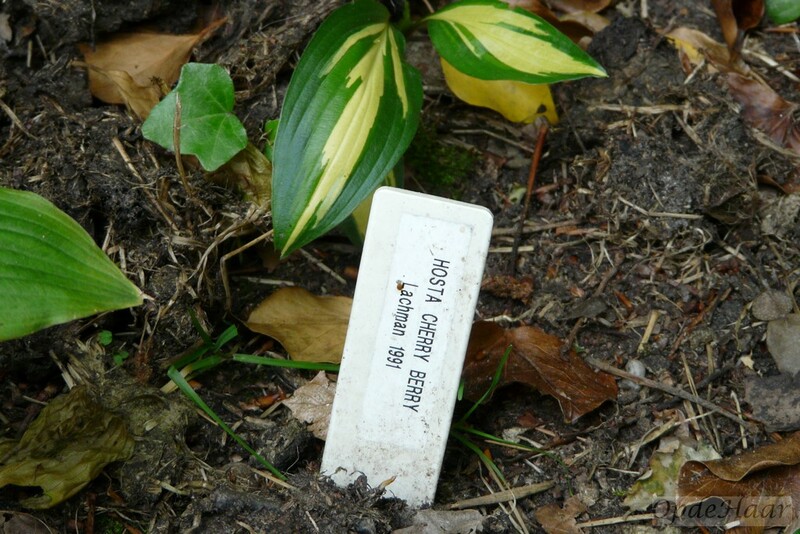 It is a bit of a game with us to grow many seedlings on in the hope that we may discover a worthwhile “sport” – a plant with a difference, which is commercially interesting! Anybody who reads a book on hosta varieties cannot fail to be struck by the large numbers of varieties that arise as “sports”. 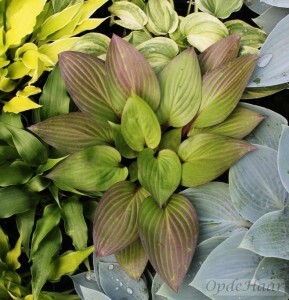 In other words, in total contrast to work with plants such as roses and rhododendrons, where new hybrids are often the result of careful and calculated crosses, new hosta hybrids are largely arrived at by chance. 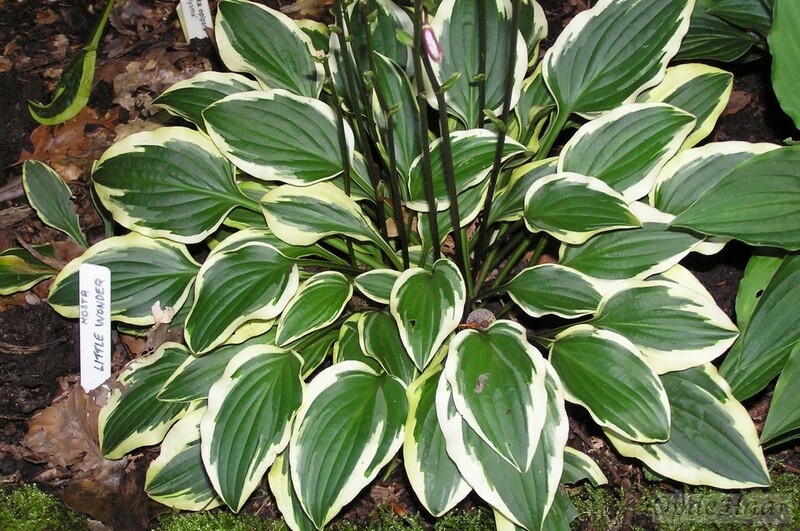 I find this rather hard to believe but it is true, the relative flood of new hosta introductions suggests that there is some interesting scope for anyone prepared to set about some deliberate hybrid crosses. 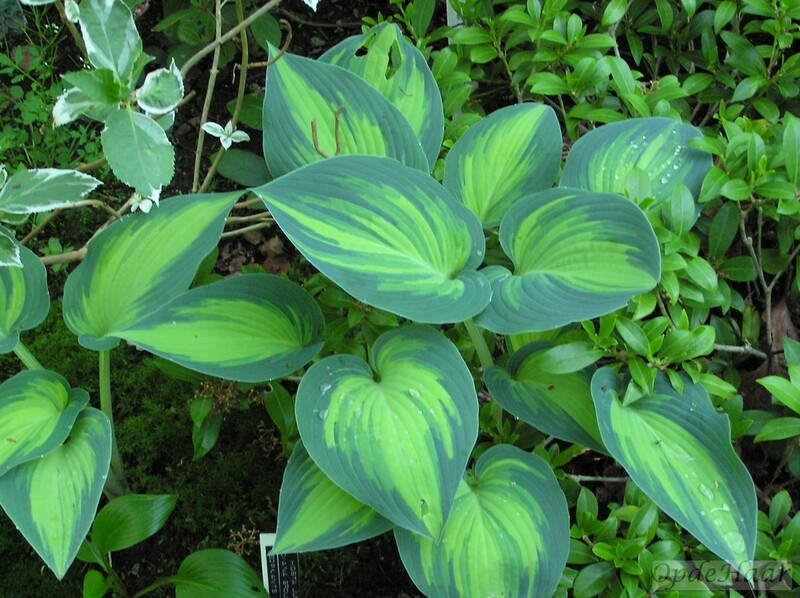 When I raised this subject with a leading hosta nurseryman, he pointed out that tissue culture was increasingly used to propagate new stock and that chemicals and hormones used to get new plants going must, in his view, contribute to the extensive sport formation. At the risk of bruising the sensibilities of some hosta fanatics, I often think how very similar a lot of the otherwise lovely varieties are – particularly from the point of view of someone primarily interested in their decorative value in the garden. 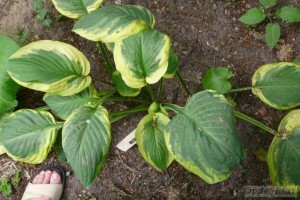 Similarities are not at all surprising when one delves into the origins of the varieties since, particularly where sports are involved, I assume that a novel leaf colour or variegation arises because a normally recessive gene becomes “activated” for some reason and is then acceptably stable for subsequent propagation. 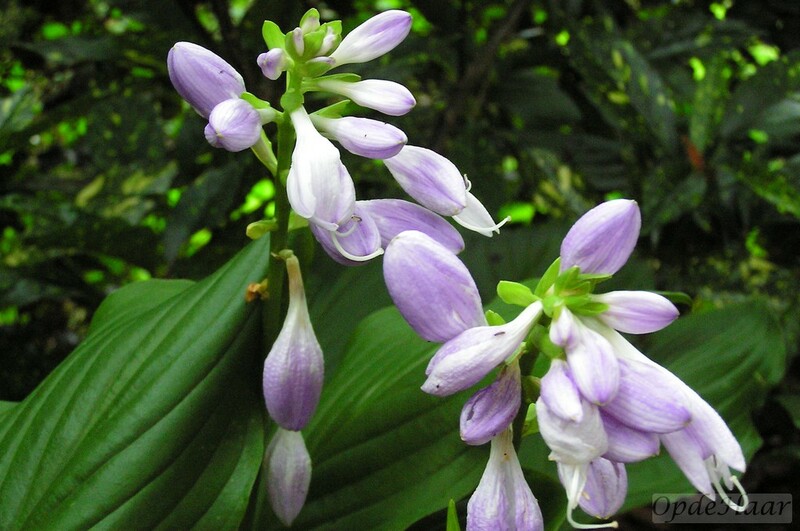 If one starts with a basic set of genes as in Hosta Fortunei which is in all probability itself a complex hybrid, the “Hyacintha” variant has given rise to several sports which in turn have sported. 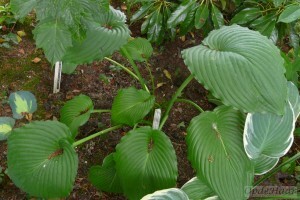 A sport arises as a result of shuffling a given series of genes. 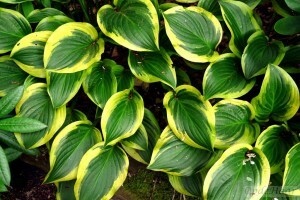 If this process occurs frequently and repeatedly, it would be surprising if the results did not give virtually identical sports on occasions. For example, “Hyacintha” sported to give “Francee” which then gave rise to “Patriot”. 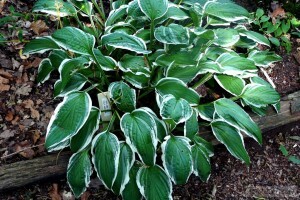 More recently, “Patriot” sported to give “Loyalist” while “Francee” produced “Fire ‘n Ice”. 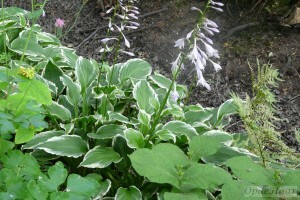 “Loyalist” and “Fire ‘n Ice” in our garden are as identical as one can get. 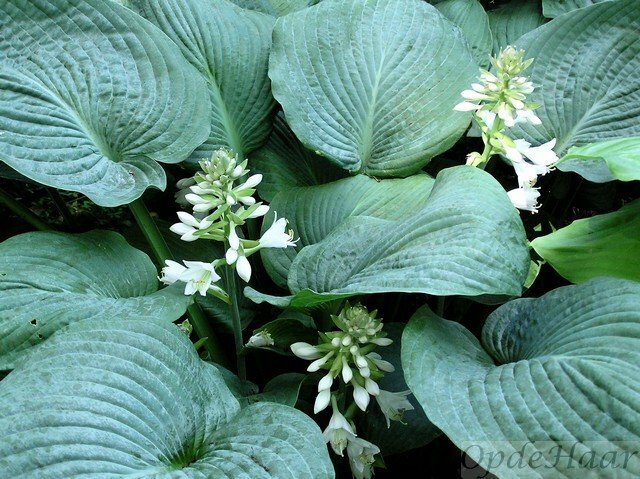 With no disrespect intended to the nurserymen involved with these two sports, I do wonder if a more critical filter on new named varieties wouldn’t be helpful. 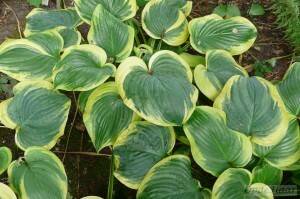 Cutting a long story short, it seems an area of hosta culture that would be interesting to follow up. 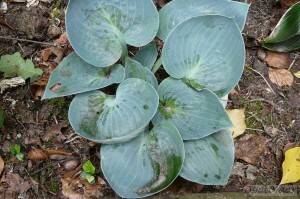 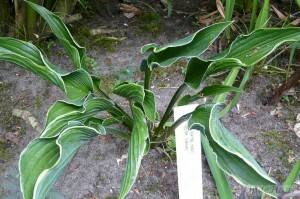 Joining a Hosta Club or Society www.hostavereniging.nl would be a good starting point. About a decade ago, it was realised that the discolouration and mottling of leaves on some hostas was caused by a virus which is now called “hosta virus X” or simply HVX . It is very serious because it is easily spread by slight mechanical damage while handling infected plants and will weaken and eventually kill hostas. 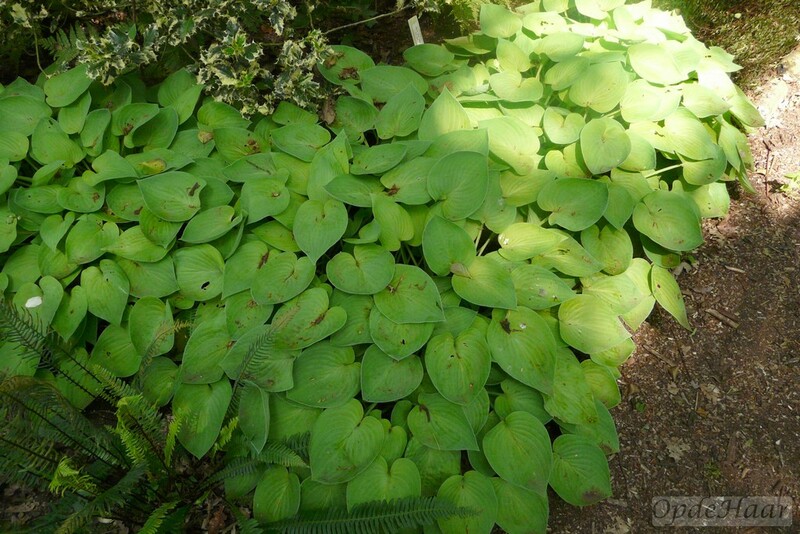 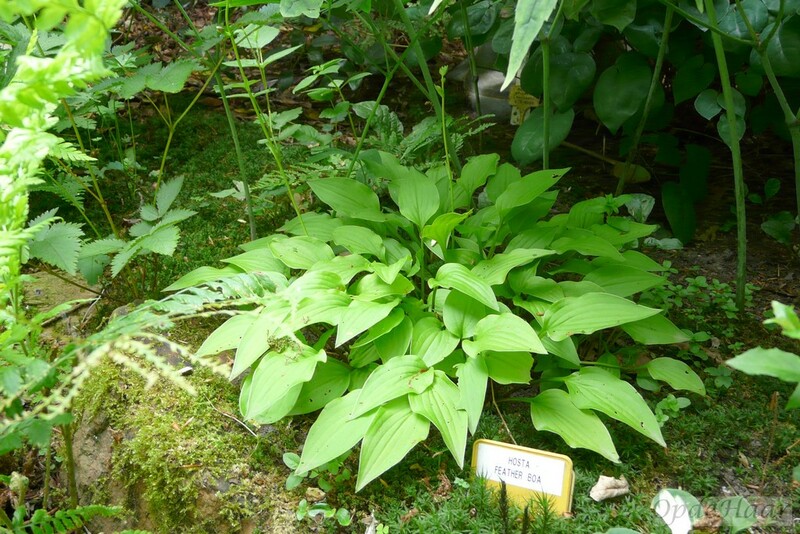 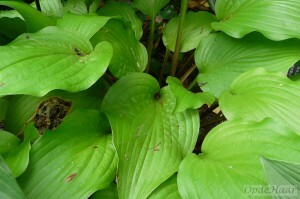 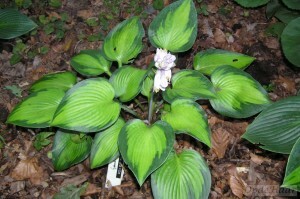 There is a lot of information on the Internet under a search of “HVX, hosta” with pictures of infected plants. 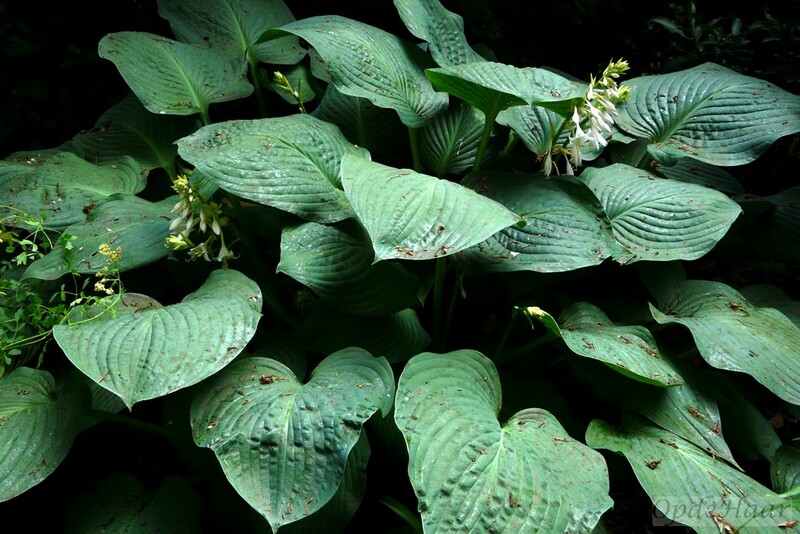 The virus cannot survive in the soil so the total removal of a plant including every bit of root followed by thoroughly cleansing the hands should be OK for most gardeners. 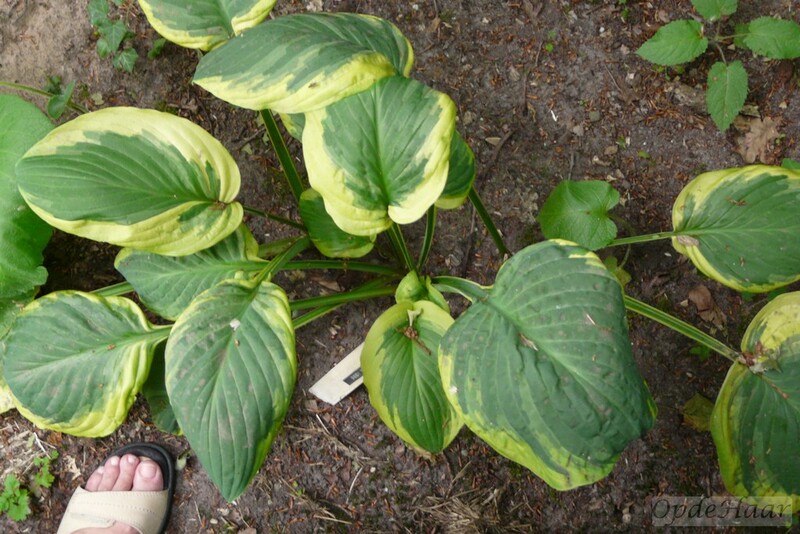 The situation is orders of magnitude more serious for nurseries and holders of collections because the virus can be so easily transmitted and one visibly infected plant can imply that the whole of a collection is infected because symptoms can take a few seasons to manifest themselves. 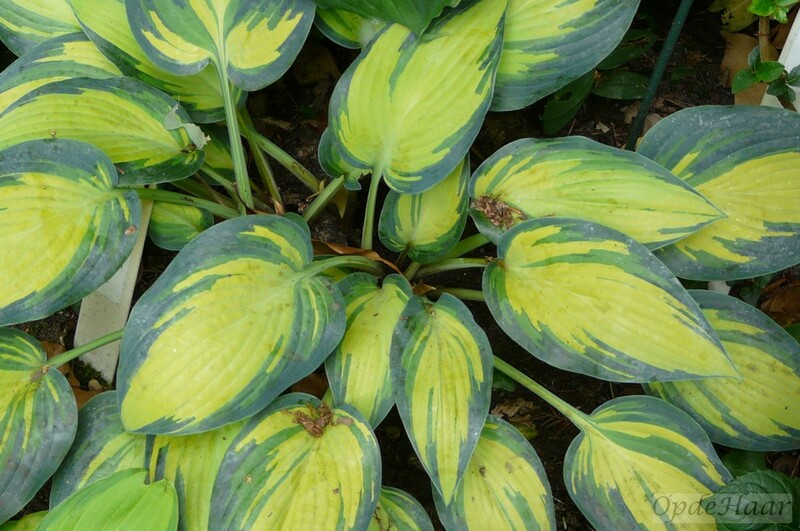 Finally in this last context, our major Dutch hosta nursery with significant international trade, Fransen operates a very rigorous (and costly!) 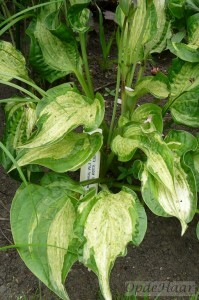 joint testing programme to ensure as far as practically possible that their plants are free of virus.